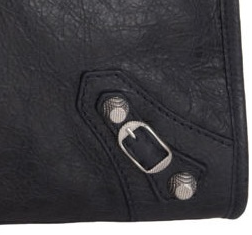 minuet of life: Which Balenciaga Hardware? Which Type and Size? 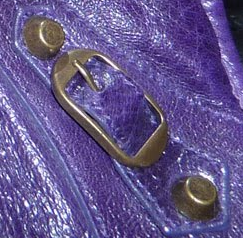 We all know that it's soooooo freaking hard to decide which hardware on which leather works best. I myself haven't been able to really decide on which ultimate combo I'll get on my dream B-bag. 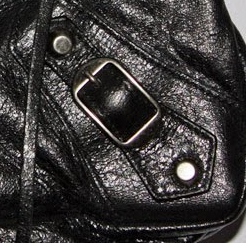 I've never owned a B-bag before, mostly due to reasons like the bag's sloppiness and lack of structure (I love structured bags where I know my stuffs won't be flipping around and which are where). But that alone doesn't take away my fondness of this motorcycle line. They're so cool! Specially the candy colours (red, yellow, orange, green, blue). Really an eye candy. So let's begin my lesson with the hardware. The abbreviations below are some of the common terminologies used by shoppers/boutiques and it'll be really useful to memorise them. People in the fashion forums and blogs also use this a lot. And here's the picture examples. First type of hardware produced in this motorcycle line. Also called as RH or regular hardware. This is the only classic hardware that is still produced nowadays. The hardware is made of aged brass which has been oxidised in colour, but over time it will wear off and show the true brass colour (right picture). Also known as GSH or GGH or Giant 21. Bigger than regular hardware and thus make the bag much heavier. In the new Spring/Summer 2012 collection Giant silver and Giant rose gold have been discontinued and replaced with the new "Mini" giant hardware. 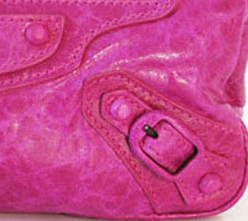 Produced only for 2007 limited edition bags. 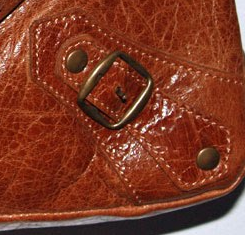 It looks like regular hardware, but with a layer of matching leather over it. Only produced in Fall 2008 and discontinued not long after. 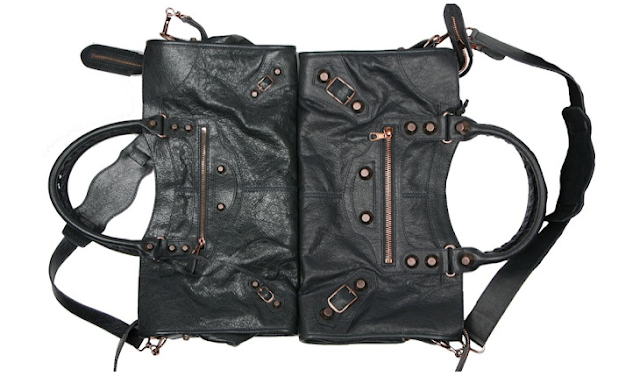 Well, as the name implies, it's giant hardware covered with a layer of matching leather. 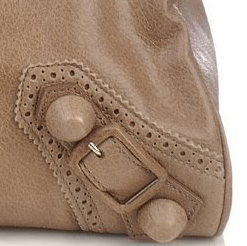 Comes with perforated trim along the bag. Still in production now. 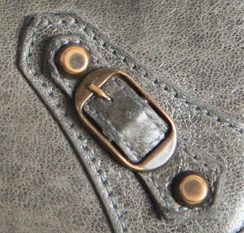 Light pink gold hardware with a vintage look, achieved by darkening the grooves of the thimbles. 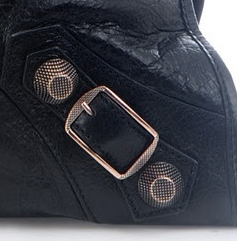 In the early production, the zippers are not darkened so they are still in light pink gold colour. 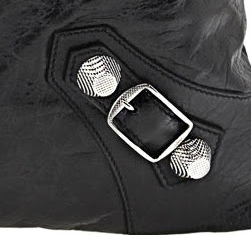 But since Fall/Winter 2012 the zippers are also darkened to get the "aged" look. Now it's replaced by "Mini" giant rose gold hardware. 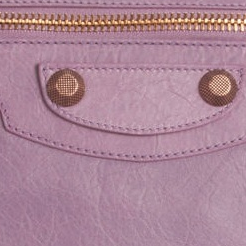 Produced to commemorate the 10th anniversary of the classic bag. 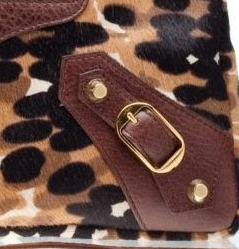 Also used on various other styles such as animal print (right pic). This is supposed to be the replacement of Giant covered hardware (right picture) because of its lack of popularity. 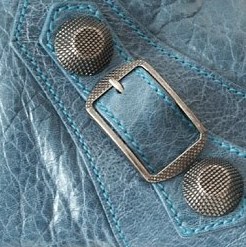 The giant hardware is smaller in size and the perforations are larger, with a contrasting colour underneath. 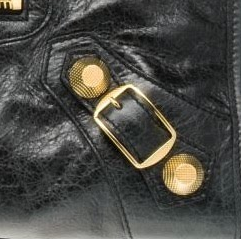 Since Spring/Summer 2012, Balenciaga replaces all its bags from using Giant hardware (Giant 21) to Mini Giant hardware (Giant 12). Rumours are many people complain that the Giant hardware bags are too heavy and this has prompted Balen management to resize the hardware. 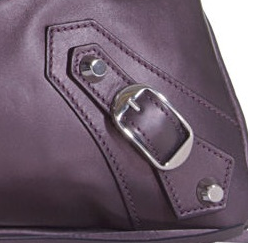 Mini giant hardware comes in two sizes: Slighty larger size for Balenciaga Day, Work, Weekender, and smaller size for Balenciaga Hip, Envelope, Mini Pompon, First, Town City, Velo, Part-time. Some said it's possible that the Giant hardware will be re-introduced as a boutique exclusive. Mini giant rose gold part-time versus the giant rose gold. For me, I think I'll go for Mini giant rose gold (mrggh). Reasons? A lottt..